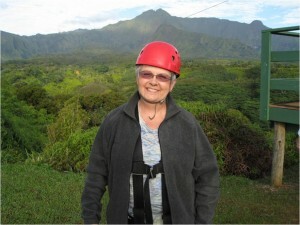 Trust in Kauai – Zip lining. Living my zip line dream on our Hawaiian vacation taught me to trust. “Just keep walking until there’s nothing under you, then sit down and enjoy the ride” I waited ‘til last in line, grabbed the strap with both hands, took a deep breath and walked off the platform at 10,000’. A hundred shades of green, mountain peaks, ponds and waterfalls lay below me, but I was too busy trying to steer and land feet first to notice them on that first run. Bundy told us later that was the highest point on Hawaii’s garden island– Kauai. I was zip lining! Whoo Hoo! The gear felt surprisingly heavy at first, but I was thankful for every ounce when it carried me. “Keep your hands off the cable! Only hold the strap, not the metal clip above it. Just relax into the harness. It will hold you.” Bundy told us. “Steer with your knuckles. Turn them toward your knees. Feel the tension like steering into a slide when driving on icy roads.” Good advice, but how do they know about icy roads in Hawaii? My word for 2014 is Trust. What a way to push off for the year! Letting go at those heights? Yes, I was shaky, and grabbed the strap as if my life depended on it– well, it did. But that strap and harness would hold even when I let go. My energy was better spent enjoying the view and the experience. That’s my take away for my Trust year. The first run was the shortest. They got longer, lower, and more fun when I remembered to exhale and relax into the ride. We had a great group—lots of laughter and encouragement. The young couple always made perfect landings; experience was with them. Margaret and Bill from South Bend and I took photos of each other, soon to be shared between us. Jean and Walter quickly picked up the steering strategy. John knew what to expect because he had done the same runs a few years earlier with his daughter. While we waited for the shuttle, he honored me by sharing their story. She would have been with him again, had she not passed a few months ago. This time he dropped a lock of her hair on her favorite run. My heart goes out to their family. Randy was our strong and very upbeat Hawaiian “catcher”. I panicked on my first run when I came into the platform backwards, but soon learned he “had my back”. Trust feels great. I felt no more fear, just exhilaration at actually being there and fulfilling my dream. By the fourth run, I let go of one hand, and finally drank in the breathtaking view. Steering didn’t matter anymore. I wanted to remember this first zip line experience. My husband chose the ground tour so he could get some great photos, which we are enjoying now. I hope we will come back and zip line together. Now to Hang Loose for the rest of 2014.